Jean-Claude Juncker said the lack of a "permanent structure" resulted in money being wasted on missions. Part of his annual state of the union address was devoted to the UK's unexpected vote to leave the EU. 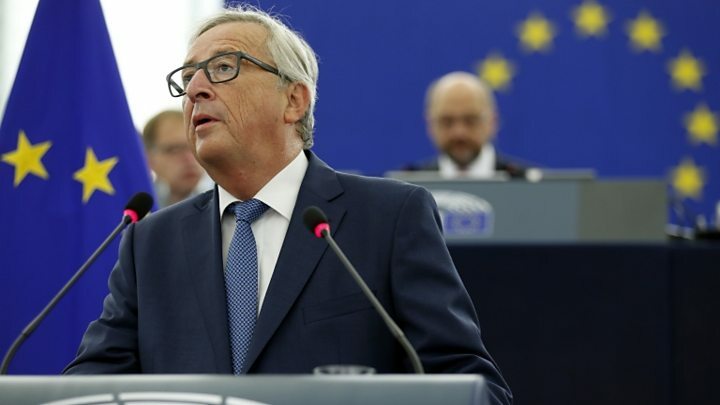 Modelled on the state of the union address by the US president, the Commission president's annual speech was introduced in 2010 to detail the state of the EU and future legislative plans. Won't a common military force interfere with Nato? But Mr Juncker said a common military force "should be in complement to Nato". "More defence in Europe doesn't mean less transatlantic solidarity." On future Brexit negotiations, Mr Juncker warned that the UK could only have unlimited access to the single market if it accepted free movement of people and goods. "There can be no a la carte access to the single market," he said. Prime Minister Theresa May distanced herself last week from remarks by Brexit minister David Davis, when he said remaining in the single market would be "very improbable" if it meant giving up control of British borders. Jean-Claude Juncker and his team agonised over the wording of Wednesday's speech. The UK's vote to leave the EU is undoubtedly one of the biggest crises the bloc has ever faced but Mr Juncker was determined not to dwell on it. There were few words on Brexit. His main message: "The European project continues. Let's choose to look forward. Be positive." Public trust in the establishment is low - whether traditional politicians, bankers or EU bureaucrats - and Mr Juncker is an unelected president. 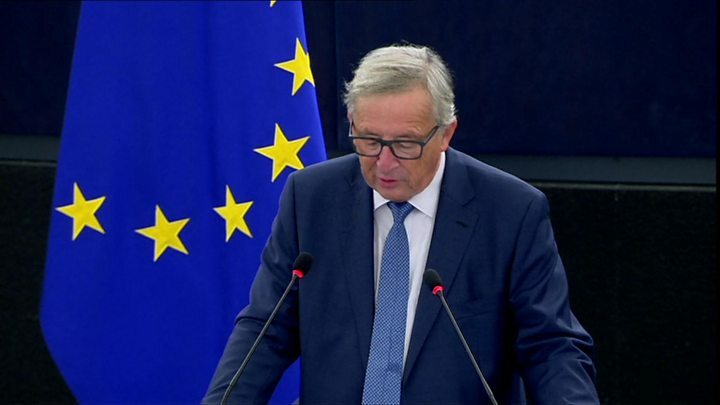 Mr Juncker admitted the EU was facing an "existential crisis", and he also warned that splits in the union had left space for "galloping populism". In a blunt criticism of recent attacks on immigrants in the UK, he said he would "never accept Polish workers being beaten up, harassed or even murdered on the streets of Essex". Creating solidarity in the Union - such as protecting unaccompanied minors migrating to the EU - but Mr Juncker said this must "come from the heart" and could not "be forced or imposed"
Promoting security including strengthening the EU's borders and promoting greater security co-operation between member states, as well as greater military centralisation. He urged a renewed focus on the EU as a "driving force that can bring about unification, for instance in Cyprus". Image caption Mr Farage accused the European Commission president of "sticking to dogma"
But Belgian MEP Guy Verhofstadt, the European Parliament's lead negotiator on Brexit, said the EU still offered the "cure" for "the cancer of nationalism"